I generally have a hard time believing anything that any of the Jacksons say. No, I’m not suggesting they’re out-and-out liars. It’s just that their lives have been so thoroughly distorted by media overexposure, they’re always straining to counter public perception, or to feed the tabloid ticker. And their comments are so sopped with grandiose warm-and-fuzzies about love for the fans and love for one another, they generally seem more disingenuous than honest. A&E’s six-hour reality series “The Jack5ons: A Family Dynasty’’ did not change my mind. “I basically just want the cameras to roll and see who the brothers are,’’ Tito says. But this family portrait clearly has hidden motivations, spin control, and commercial agendas lurking in the shadows. 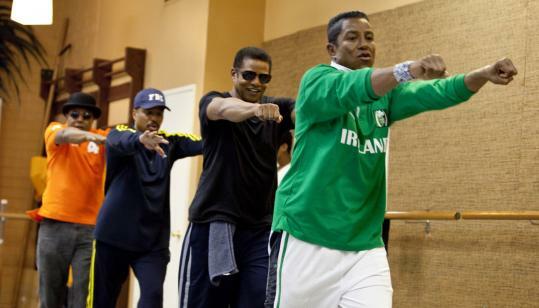 Indeed, the reality TV genre suits the Jacksons well - Jackie, Tito, Marlon, and Jermaine can appear “real,’’ and yet stage the shots and situations to their advantage. They can reveal tears and petty conflicts to keep us entertained, but resolve them all nobly and with brotherly solidarity. The premise of the series, before Michael Jackson died on June 25, was to chronicle the 40th anniversary reunion of the Jackson 5. The better part of tonight’s first hour is set in the months before Michael’s death, and we see Tito, Jermaine, Jackie, and Marlon convening to talk about making music again. Amid the affectionate bickering, a birthday call to sister Janet, and a dance class, there’s no mention of Michael’s participation, and that question is negated when Michael dies. Lest we think that the surviving brothers are now trying to cash in after Michael’s death, the second hour gives us a scene of their lawyer telling them they are obligated by contract to perform together. They’re still doing this because they have to, you see. Jermaine has taken it upon himself to be the show’s drama queen. In one sequence, he recalls his break from the Jackson 5 in the mid-1970s, saying his decision to stay at Motown when the others went to CBS Records was not because he was married to Berry Gordy’s daughter. “Motown introduced us to the world,’’ he says, sobbing and inspiring tears in the generally cool Tito. It’s hard to believe this is the first time the guys have processed this major bit of history together, but “The Jack5ons: A Family Dynasty’’ would have us think it is. Later, Jermaine refuses to attend a photo session in New York and triggers rumors that stir up some tabloid interest. All along, Halima, his second wife and “caretaker,’’ as he calls her, helps him weather the storm. I see a sequel reality series in Jermaine and Halima’s future. Tito also plays press manager for other family members toward the end of the second hour, when he takes us on a detour to meet his three sons, a band called 3T. We see 3T trying to record an album but feeling paralyzed by the loss of their Uncle Michael. They’re desperately hoping the world will still be interested in them, just like the rest of the Jackson family. Matthew Gilbert can be reached at gilbert@globe.com. For more on TV, visit boston.com/ae/tv/blog.